There was recently a garden expo at our local garden center and there were GORGEOUS chickens there. Wanted a couple of chicks after that. The city said sorry but no :( Sigh.... Just have to keep this in mind when we move next. Yours are beautiful! I do so agree with every word...we welcomed our Dixie Chicks into our kypos last Oct...and love every minute with them..such funny things..husband chats to them constantly!! you make me wish I did not live in the city! that nice brown egg is very pretty. Love those chickies! The pic of the one looking in through the window is so cute! Chickens make a garden a better place, and in our case, our neighbour's gardens too. Waiting for the next batch of cheeps to hatch out - a very broody mother hen won't let us anywhere near! love the pic of you and chickidee both facing the wall. And the peering through the window. I have been contemplating a purchase for a while now-and you have only succeeded in making me want them even more! I am just worried about the practicalities and peeing off the neighbours. Sigh. You blow me away......your creativity is endless. How inspiring! BTW my word verification is 'prettio'. thankio. Your hens are fantastic! 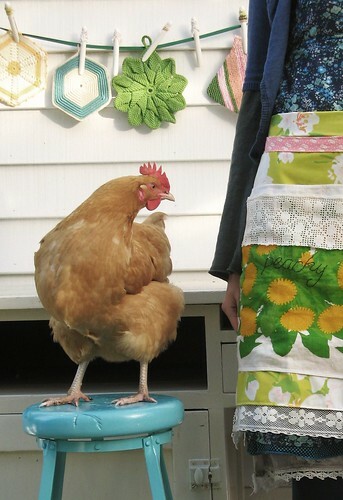 I have wanted hens for years, but I guess I have to live without... And they make such a great addition to your product photos! 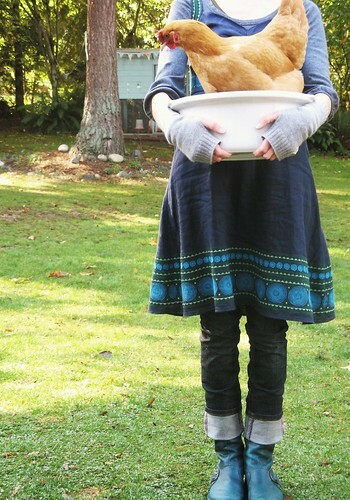 I am really looking forward to having chickens one day soon. What great photos, I was really having a giggle over a couple of them. I totally agree. I love my girls. Love your girly pics as well. i really want some chickens but don't have enough space for them. I also fear the dog might eat one. Thank you for your encouragement. This is the year Poopsie and I will build a coop! What a great post! I just love your beautiful chickens and what you write about them. Keep the pictures coming; would love to see more. This really makes me want to get some of our own! 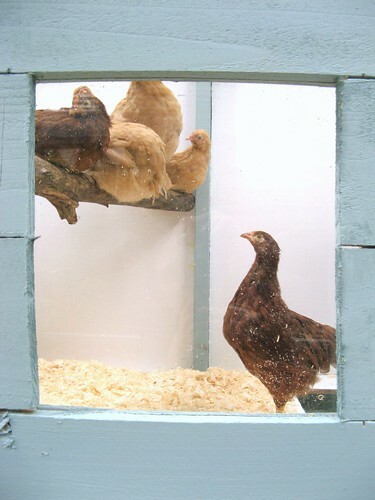 Love the pic of brown one peeking in the window!! Thank you for sharing. Oh, I love your chickie poohs. Last night I asked my hubby if he thought we would be allowed to have chickens. He said he didn't think so but we were allowed to have a horse. We live on less than an acre. We looked back into our neighborhood restrictions a few years back. They said we couldn't have a home business. We could have a horse but no fences or barns. Funny, huh. I am always talking about chickens. I would expect my hubby to laugh at me but he doesn't So I obviously love your chicks. Oooops, I forgot. Love the Airstream in the background. My Mother and brother used to work for Airstream. I would love so so much to have chickens but my back garden just isn't big enough. It's the one downfall of our lovely home, I'll just have to wait until we can have a home with land - then my dream is to have chickens, a few sheep and pigs plus pygmy goats! despite the worries of our dogs, it has never been an issue, for they belong to their pack, one big family... little olive is a pesky one with them but she just wishes to get a closer look. one's biggest worries are what lurks outside the yard, but so far we have had no trespasses and i hope it stays that way. so delighted my year of being a mother hen in photos has cheered your day... it cheered mine just looking at them, i couldn't help but smile at their ability to 'perform' for the camera! 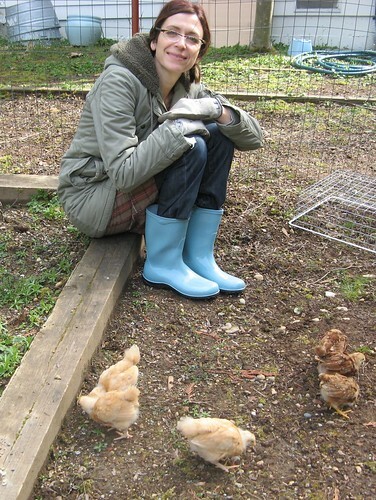 and i had to laugh at my shiny wellies in the first photo. bought especially for my moment of becoming a mother hen, they do not look like that anymore! 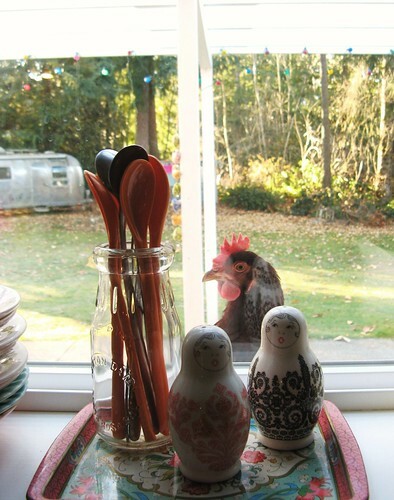 i finally talked my curmudgeon-ly man into chickens a couple of years ago, and we love them. they're so relaxing to watch pecking around the yard, so sweet! your pictures are wonderful-i must say i haven't invited mine INSIDE the house yet...!! :) love your very inspiring blog!! 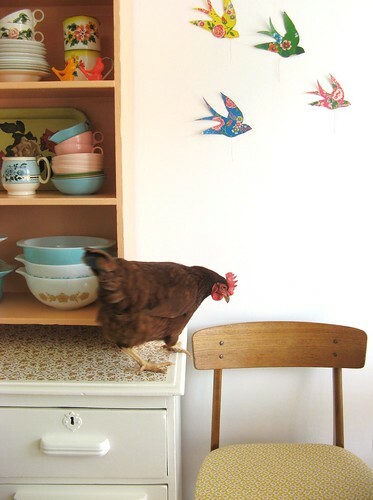 This post is a delight ... words and photos have made me smile, and dream a bit of living in a place with a back yard/garden with ... a few hens. The photo of you and the chicken both facing the wall is great!! Who copied who? These photos brought fits of giggles to my entire family. 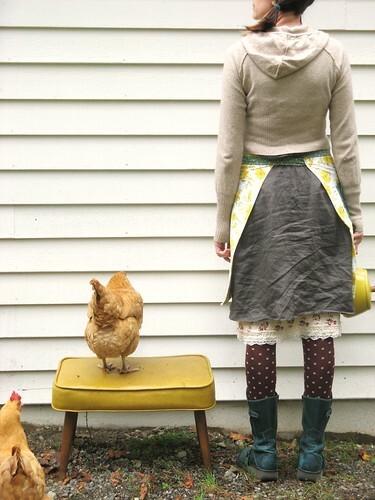 There is no way to choose a favorite, although I think the one where you're turned away from the camera and the hen is on the stool beside you wins by a hair (feather?). Thanks for making my day! 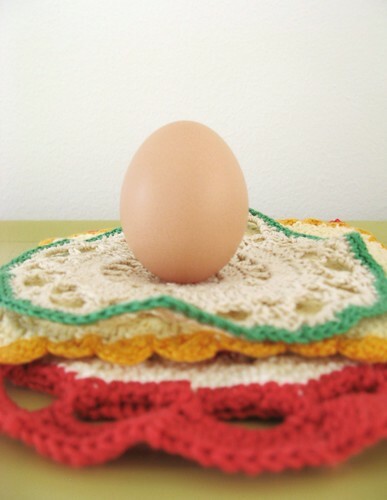 your posts are inspiring, uplifting, and always farm fresh and free range! such inspiration and lovely color in your photos! I appreciate the doile over tree stump - fabulous idea! I love your photos of your girls Tif! Very stylish chicks they are. I would love to have some sweet little chickens in our yard, I just have to convince hubby that he does too. Unfortunately we have neighbouring cats that seem to think they live here. I'm guessing it's not going to be a good mix? Are they messy in the garden too? I really have no idea but they look great and it's the only animal I'm not likely to be allergic too! Love the photo of you with the baby chicks and your son...too cute. I would so love to have chooks but im afraid my Dearest Dog would have a feast! dearest readers, do not be afraid of a chicken and a cat. remember these are farmyard creatures... dogs and cats tend to leave their own pack alone, there is an unwritten rule between them... a cat may watch, a cat may fancy but a cat will never have. (obviously if its a big cat like a tiger, i'm thinking my lovely little assumption isn't true) but a domestic cat may try it's luck but none it will have... chickens show the cat whos who and where they may roam within the boundaries of what is comfortable. 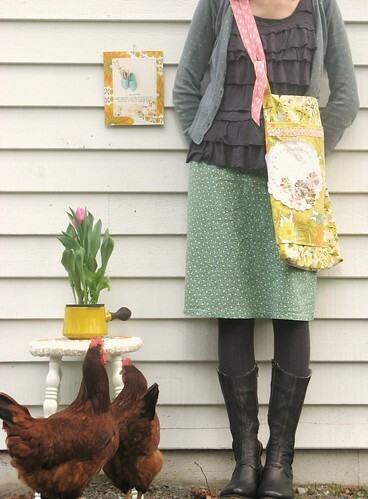 delightful photos and adorable chicken family! The charm of a 'chouck' you can't beat them, sadly Foxy loxy lurks in our neighbourhood and we keep ferrets so chickens would not be safe if our little haven! I have chickens too, they are fab friends aren't they (especially giving me egg presents every day :-) ). I do know of someone whose dogs *did* have the lot of them, but on the whole so long as they are well trained dogs aren't an issue. And if you have dogs you are less likely to be bothered by foxes. You truly tempt me. I wonder if city peeps have chickens here in Grand Rapids? Also, love all your boots. 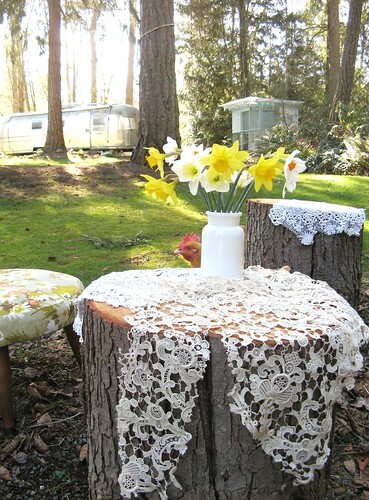 Oh, and I'm to be getting some stump tables that will now definitely be having lace on them as some point this summer! the butts shot is best!! great post! yes we have predators in the ways of coyotes and possums. when building the coop it was built with the mesh going deep into the ground. we were told if a two year old child can open the coop then a possum can, so latches are lockable if needed. we have not had coyotes sniffing around but then we have dogs and a lot of toing and froing in the yard by us... but saying that we had a mild winter so wildlife perhaps did not need to come into town. we do not live in the country, mossy shed is in the heart of a city or large town as we would say in the UK, i live an urban life but with a bit of countryside in my back yard. our city rules allow for a certain amount of farm animals depending on your land size. not having a rooster means most people don't even know we have them until i mention it... but don't get me wrong, when wishing to lay an egg, one or two of them let me know just how fabby they are by making a whole lot of noise so i take notice! ohhh... I love this! I had no idea. we got our plans for a little playhouse coop and need to get busy to make it happen this year. I've always wanted chickens! I love my chickens, and now we have introduced Mr Chicken, so things could get very interesting! i adore this entire post!!!!!! love your chickies! hey, have you done a posting about your camper? 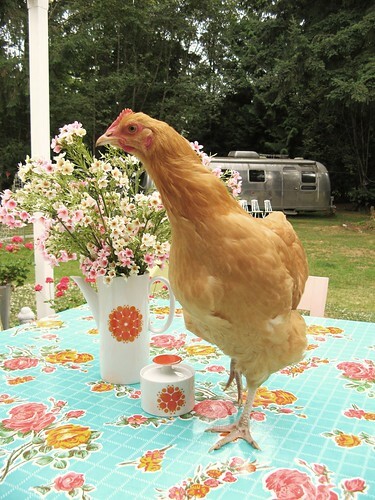 I would love to have some chickens..in the meantime I really enjoy yours! Oh, don't push me off the fence!!! I have a book about chickens in the living room, loaned to me by a dear friend (she has a collection of back yard chickens) and my daughter has informed the family she will give up the ground floor of her treehouse to house chickens . . . 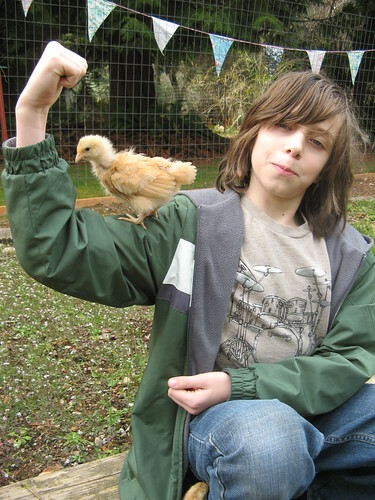 I think the love of my life is looking on Craig's list for chickens right now . . .